Few woodworking machines are as versatile as a radial arm saw when you consider the number of operations it can perform. Once you add one to your arsenal of woodworking tools, you may find that it is your go-tool tool for most operations. In workshops with limited space, it can stand in for several space-gobbling tools. Radial-arm saws are heavy, bulky machines that typically are not very portable. They are also fairly expensive and are somewhat difficult to keep in alignment. All these factors make them more common in dedicated wood shops, where portability isn't a concern and the owners can master their use. While it is mainly a crosscut saw, this tool can be used to rip, cut bevels or miters, dadoes and rabbets, form moldings, and in some cases, even serve as a guide for a router. There are trade-offs to all of this versatility. For one, many radial-arm saws are more difficult to set up cuts than some other tools. 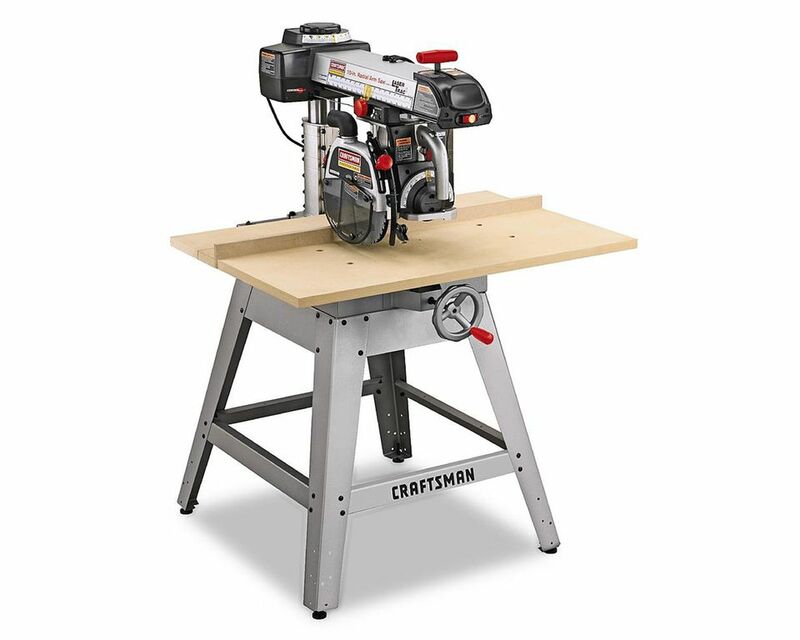 For instance, to cut compound miters, it's easier and quicker to set up a compound miter saw than a radial arm saw. To rip-cut stock, a table saw is a much faster setup. A radial-arm saw can handle both tasks with ease, which gives the considerable value despite its hefty purchase price. As with all tools, be sure to read and thoroughly understand the instructions that accompany your tool before you begin to use your radial-arm saw. Making sure that your saw is set up properly as per the manufacturer's specs will not only teach you the features of the saw but how to use it safely. Each technique will require specific knowledge. When crosscutting with a radial arm saw, set the blade depth just below the surface of the table. If you're using your saw for the first time, you'll end up cutting some grooves into the sacrificial table top, so lower the blade to the cutting position after the saw's motor is up to speed. Never free-hand any work on a radial-arm saw. Always hold the stock securely against the fence. as you pull the saw toward you, through the stock, the blade's rotation is cutting away from the body. This will cause sawdust to blow away from the user, but it can also cause the saw blade to lurch or climb forward toward you as it cuts through the stock. With this in mind, keep the pressure on the handle and don't let the saw determine the speed of the cut. The motion of pulling the saw toward your body and then holding it back while the blade is cutting can take some practice. Some users adapt to this peculiarity of the saw by starting crosscuts with the blade pulled forward and pushing the spinning blade back toward the fence to cut through the stock. The radial-arm saw is the perfect tool for cross-cutting dadoes and rabbets, particularly when making tenons or slots for shelf standards. Raise the blade away from the table and install your stacked dado set to the thickness desired, making certain to install it in the proper direction for the rotation of the blade. Once the dado set is installed and the blade guard reattached, use a scrap piece of stock to help you determine the proper depth of cut for your dado. When the setup is complete, cutting dadoes and rabbets is as simple as making standard crosscuts. The same dado set also makes cutting tenons a breeze. A radial arm saw can typically cut miters of up to sixty degrees to either the left or right, and bevels of up to ninety degrees, but typically only in one direction. While this allows a radial-arm saw to cut more complex compound angles than a compound-miter saw, it can also be a bit more challenging to get the angles just right. Always check to make sure the clamping levers on the saw are locked in place before beginning a cut. A less popular, but no less useful function of the radial-arm saw is to use it to rip stock. While there are some limitations of widths of cut that can be performed on a radial-arm saw, once the setup is completed, it is no less difficult to use than a table saw. When setting up your radial-arm saw to rip, be certain to always make use of the anti-kickback assembly, consisting of a riving knife and pawls. The riving knife is designed to help keep the stock from binding on the blade. If the blade jams during a rip cut, the pawls are designed to grab the stock and prevent it from kicking back. Make it a habit to always set the depth of the riving knife and pawls to the size of the stock, according to the instructions that come with your radial arm saw. When ripping melamine or other plastic-laminated stock, the pawls may not grip the stock in the event of kickback. Special attention should be given to the blade guard. The saw should never be turned on without the blade guard securely in place, nor should the lower section of the guard be permanently altered so as to keep it above the base of the table. Make certain that the guard can be easily lifted with the operation of the saw and that it drops back into place when released. When setting up your radial-arm saw, install the entire unit with a slight backward slope. In this way, the saw will be prevented from sliding toward the user under its own weight. Never begin a cut until the saw blade has reached its maximum speed. Control the speed of the cut, which will not only make for safer use but will also produce better cutting results. Always double-check that the hand holding the stock against the fence is clearly away from the path of the blade, not only when cross-cutting, but also when ripping. Use feather boards and a push stick as necessary.